In 1998, Squaresoft (now Square Enix) would do for tactical RPGs what it had done for more traditional JRPGs just a year earlier. What Final Fantasy VII was to Japanese role-playing games as a whole, Final Fantasy Tactics would be to its grid-based subgenre. That is to say, it wasn’t the first of its kind, but it did definitely lure a whole new flock to the fanbase of games like Fire Emblem, Tactics Ogre, and Bahamut Lagoon. In the decade that followed, perhaps in part to the subgenre’s new-found international popularity, we’d get all kinds of games like Saiyuki, Disgaea, Jeanne d’Arc, and Valkyria Chronicles. 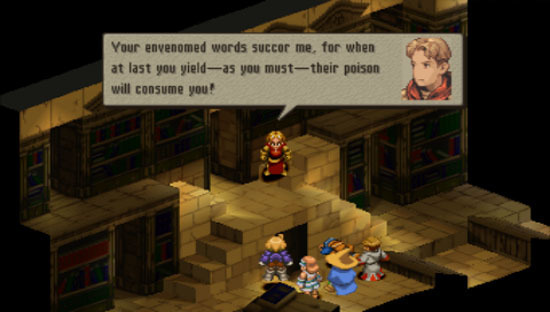 In 2007, the PSP received an enhanced port of Final Fantasy Tactics, subtitled The War of the Lions. Previously only available on UMD, it’s also now available on the Japanese and European PSN stores, with a North American release scheduled for tomorrow, July 19th. Whether you’re shelling out for it or just salivating wishing for the chance to do so, this baby is worth every Euro. As a review of a port, the details of this writeup will focus primarily on how well the game it succeeds as a port rather than an outright review of Final Fantasy Tactics itself. Playing this game for the sixth time was quite the experience. No matter how many times I go through this, it captivates me. 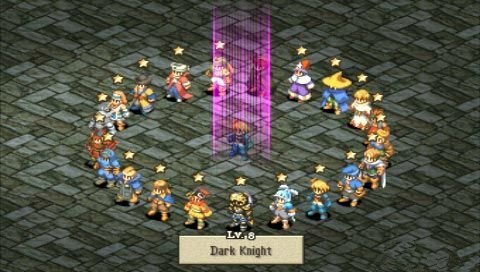 In a tactical RPG, the importance shifts towards the battles and growth interface more so than in the standard turn-based or action combat systems in other RPGs, and Final Fantasy Tactics knocks that out of the ballpark. Even after having messed with systems from other TRPGs, this one remains among the most addictive and simply put, most fun of any. Making it portable was a decision in which everyone wins. Tactical RPGs in general make great portables due to their ability to quickly put the player into a large-scale battle for epic fun at almost any moment. 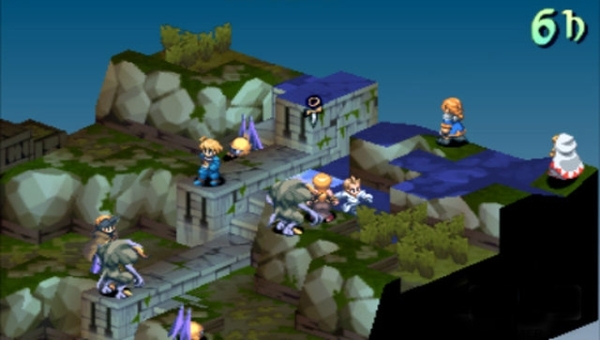 With Final Fantasy Tactics: The War of the Lions, the base game is perhaps even more addictive than ever. On the train, I’m fighting an intense, strategy-driven battle with my carefully chosen god squad. Once I’ve gotta pocket the PSP and change lines, I’m still thinking about what I’m gonna do next and how I should spend my job points. Even if you’re not using the ported portable’s portability, the base game being right in your hands just plain feels right. Square Enix took a lot of heat for making so many ports and remakes in the mid to late 2000’s, but damn if projects like this one weren’t warranted. WotL adds two new classes with the Onion Knight and Dark Knight. Vets of the original PSX game may remember the Dark Knight as being a very powerful class, of which the player only gets a small taste, via a guest character. Now, through some hard work and logging some time, players can have a Dark Knight of their own, a very cool reward. An Onion Knight starts out as a total stink bomb of a character, but a powerful force lies in store for those who love a good long-term project. Some would use the term “grind,” but when a game is as fun as Final Fantasy Tactics, a word with such a negative connotation seems inappropriate. The more job classes a character masters, the more powerful he/she becomes when turned into an Onion Knight. Luso from Final Fantasy Tactics A2 (for Nintendo DS) and Balthier from the PS2’s Final Fantasy XII also join in the fun, with their own special jobs. Luso can prove incredibly useful for monster hunters, and Balthier will also come in handy at times. They’re shining examples of how to add cameos the right way; they’re given a touch of story to tie them into the world and give them a reason to be involved in things, but it’s not something that turns everything upside-down like Balthier saying “No, lads, I’m your real father. And I killed the king. And I was the king’s father too.” Luso and Balthier have uses in battle, but they don’t turn the whole experience around by becoming have-or-die characters, which is nice. This is how you pull off a cameo. Sadly, Final Fantasy Tactics didn’t make a flawless transition to portability. Like a lot of early PSP games, it suffers from a high amount of lag. It shows up in nearly every action, even just “attack,” but the most noticeable trips and stumbles come during magic spells and special abilities. Wanna use Holy Sword with Agrias? Might as well select it, then go call your parents. By the time mom’s done telling you about the raccoons getting into the garbage again, Agrias’ll almost be done. Players who spent a good amount of time with the original will be especially sensitive to the slowdown, as our brains have already mentally saved these video files and will be flagging these slow motion reenactments. One might say that you’ll get used to it — and most players will — but a human also gets used to walking with crutches after getting hit by a car. A person gets used to only seeing with one eye after the other gets shot out by a Red Rider BB gun. And during some of these lag times, both were tempting endeavors. The move from disc to PSN was thought by some to potentially be a remedy to the lag issues, but they’re still there just as constantly as they are with the UMD version. The visuals are fantastic. In ’98, Final Fantasy Tactics looked great, though a lot of people even today don’t realize why. A tactical RPG in its nature requires a bit more space and muscle to function. The luxury of a pre-rendered background seen in other PSOne RPG powerhouses (Chrono Cross, Parasite Eve, numbered Final Fantasy titles) is not an option for a TRPG development team, as the camera must be manually zoomed and rotated quite often. FFT‘s highly detailed sprites looked great back then, and well beyond a decade later, they still do far more than just get the job done. Each story character, all enemies, and every job class member has a distinctive look about them. There are tons of possible army combinations, but there’ll be no mistaking who’s on the field, which is nice. The PSP version takes the beauty a step further with the addition of hand-drawn, fully voiced cutscenes. These don’t just occur two or three times as a tease and then disappear. Far from it, they’re more frequent one may have expected, capturing the majority of the story’s most important moments. Aside from Ramza, the voice acting is impeccable. Fans — including myself — tend to be wary of newfangled additions to treasured classics, but in the case of Final Fantasy Tactics, the new cinemas and the voice acting therein give new life to this old favorite. 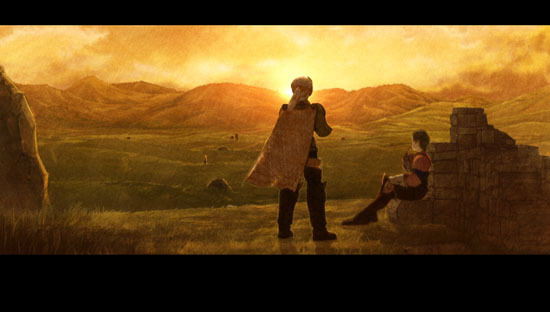 Watching famous, memorable scenes from FFT‘s gripping plot come alive in these scenes is pure delight. Compare the original version of this famous scene to the new and improved one. Yeah, wow. War of the Lions tells the Final Fantasy Tactics story better than the original, but not solely due to the new cinemas. The intricate details of the plot were somewhat muddied by the original translation — a flaw that hindered most RPGs of the era. This time around, the language is somewhat more clear though occasionally confusing for a different reason: it’s overly poetic. It packs in a lot of phrases that sound reminiscent of old-time English, but some things — just once in a while — might take a read or two to full understand, due to the unorthodox word choice. Overall though, the new script adds more character, more detail, and more comprehensibility to this chapter of the Ivalice saga, especially during the new cinemas. Playing Final Fantasy Tactics is an adventure every time. For those who have avoided it up until this point, you pretty much owe it to yourself to give it a whirl. In the case of one who already knows he deplores RPGs and/or their tactical division, perhaps there’s an exception. But just as one who is not a racing fan has to admit Gran Turismo is one of the greatest games of all time, so must the non-RPG-fan understand why this game is so incredibly cherished. It’s interesting and fresh on every playthrough, it has a story that delivers told by characters who become important to the player, and best of all, it’s a world of fun to sit down and play. + It’s Final Fantasy Tactics. + New translation, cinemas, voices, and classes are worthwhile, interesting additions to this old gem. – Whole lotta lag going on, in virtually every action of every battle.